Swirly heart shaped suckers. These heart shaped suckers are swirled with red and white coloring. These are a perfect treat to hand out at classroom parties. 22 count bag. 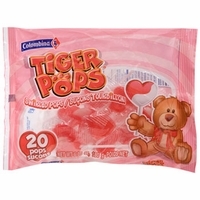 If you are looking for heart shaped suckers we also have jolly rancher suckers, sweet tart suckers and luv pops. Each bag has 20 suckers per bag.